Eating seasonally seems to make a whole lot of sense when we talk about it in the middle of the summer growing season…but in the dead of winter? Yes! It is possible to hold to a seasonal diet even during the winter months. In fact, with a little creativity, those ever abundant root vegetables, winter greens, and quality pastured meats — coupled with some preserved goodness from the past season’s harvest –can come together for delicious simple, seasonal meals. 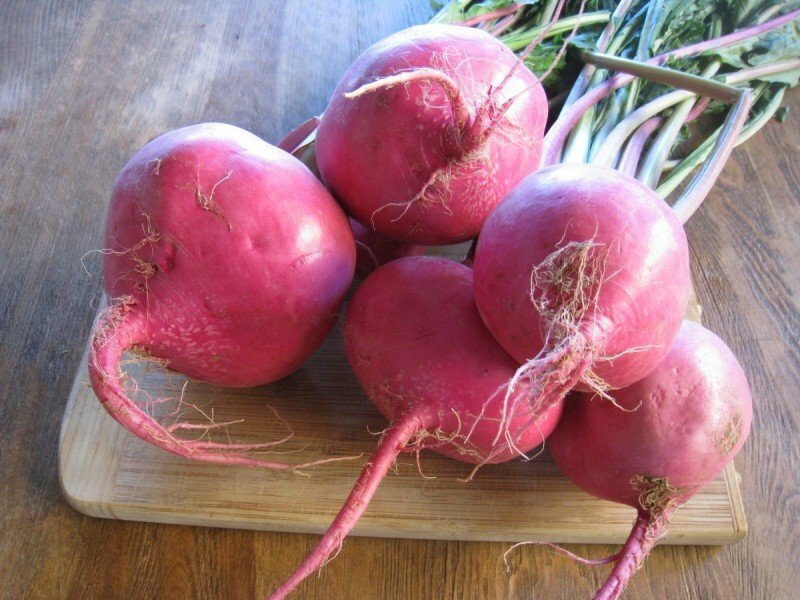 Root Vegetables, such as beets and turnips, contain vitamin C, a variety of B vitamins, manganese, magnesium, iron, copper and phosphorus. Citrus fruits are ripe for the harvest and notably high in cold-kickin’ vitamin C.
Pastured Meats come from healthy, happy animals fed a natural diet full of grass and greens. This translates into a nutritionally dense food source, containing an excellent amount of vitamins and minerals. However, in our quest to have anything and everything available to us on any given day, we — as a society — have pushed the environment and our food system to the brink. Winter produce is often required to travel hundreds, and maybe even thousands, of miles before it reaches the grocery store; most often loosing nearly all of it’s nutritional value while in transit. For example, is there anything natural about eating a fresh tomato when there’s snow on the ground? Don’t let these long months of winter be a barrier to eating seasonally! Study your local area. Learn what the people indigenous to your geographical location ate. Meet local farmers. Join a CSA. Begin now planning your spring and summer garden. 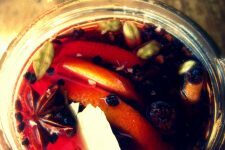 Learn different methods of preserving foods. Create simple meals that incorporate your locally-grown produce. 2. 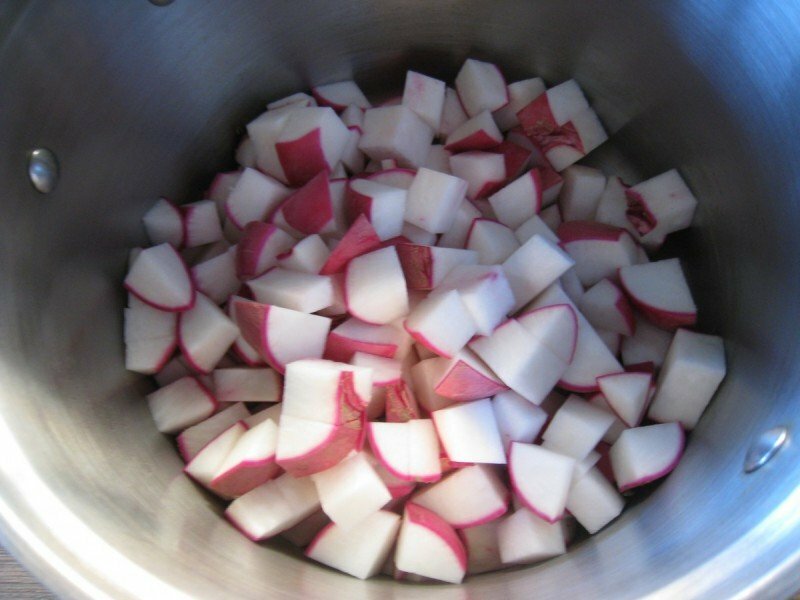 Boil diced potatoes and turnips in a small amount of water until just tender, then reduce heat to low. 3. 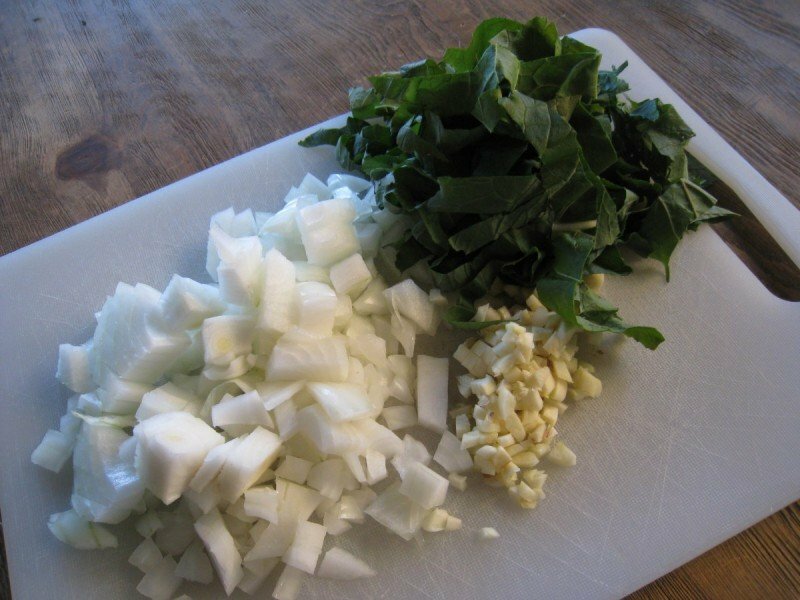 Add chopped greens, garlic, and onions to potatoes and turnips. Cook until wilted. 4. Drain off any liquid remaining, then season with salt and pepper. 5. 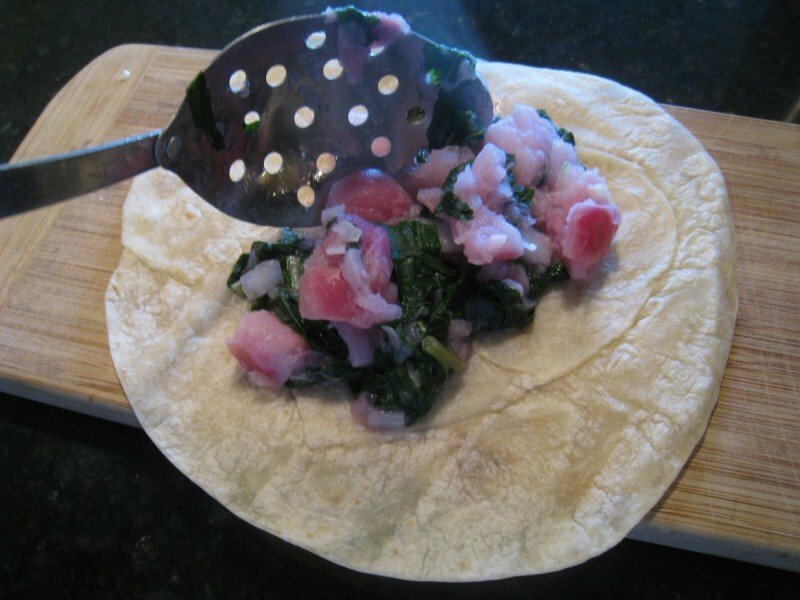 Fill tortillas with potato, turnip, and greens mixture, roll, and place in a casserole dish. 6. 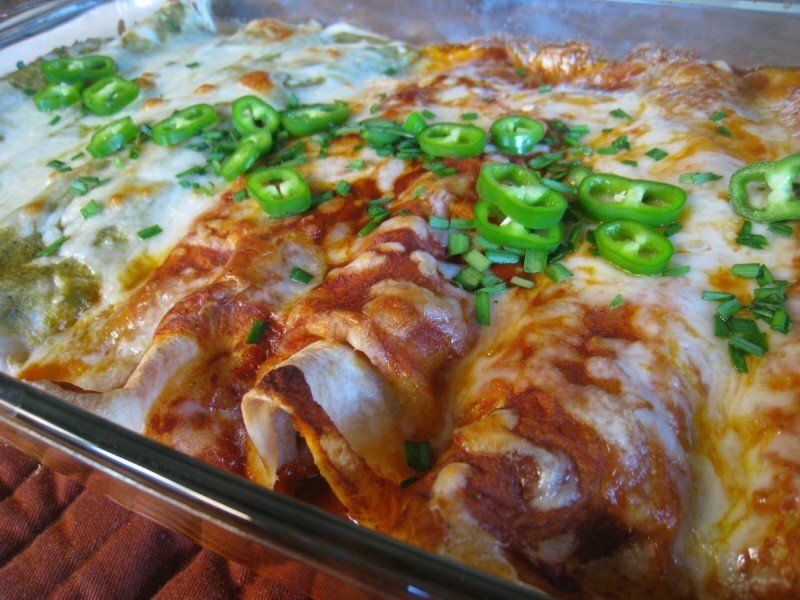 Pour enchilada sauce over enchiladas in dish and top with cheese. 7. 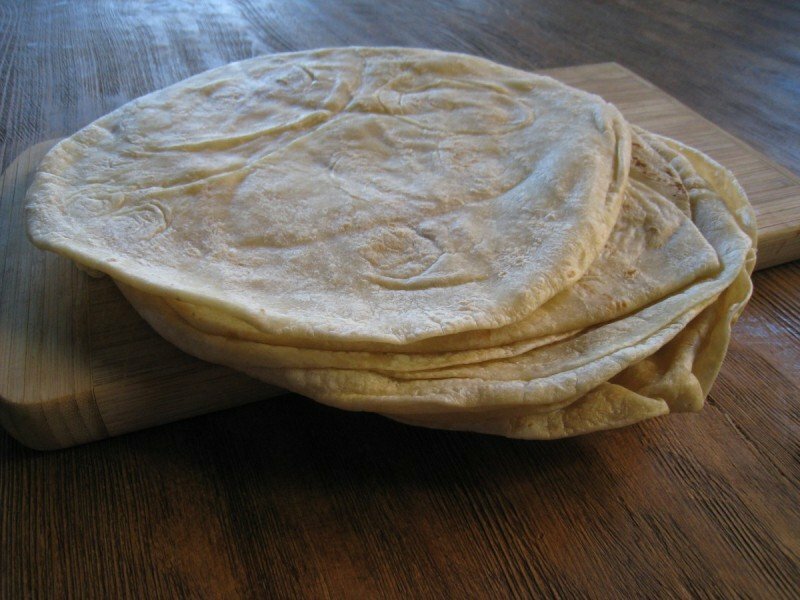 Bake for 20-25 minutes uncovered. -This is a great way to use the entire turnip. I made these tonight and didn’t have any potatoes on hand, so I used only turnips and the turnip greens. -The leftover chicken you pick off the bone of a whole roasted chicken is perfect for this recipe. Now it’s your turn 🙂 How do you eat seasonally in the middle of winter? 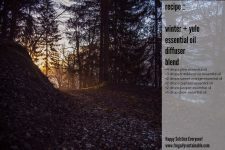 Please feel free to share your favorite winter recipes! This looks so good, I am going to try this next week. I know my hubbie will love this. Your recipe looks yummy! Thank you for sharing it. Thanks for sharing your recipe. Can you share your enchilada sauce recipe too? looks great, ready to dig in. Root veggies are on the menu along with kale and other cold tolerant greens here, too. This is a great post to remind us to not to abandon our food principles when it snows! Oh my word! I made this tonight as my husband’s lunches for the week. I was a little skeptical about using turnips. I love every vegetable under the sun, but my husband does not. If I could post a picture of the look on my face when I took my first bit, I totally would. There is no way he will be able to tell that there is turnips and beetroot tops in this. Thank you for another weeks worth of lunches for my hubby. looks SO good! they are on the list for this week. thanks for the recipe. … … any way you’ll share the enchilada sauce recioe too? 🙂 yum! Okay, husband tried it, liked it and didn’t even turn up his nose when I told him it had turnips in it! SUCCESS!!! He has a very select palate for veggies, not particularly liking any root veggies (my favourite!). 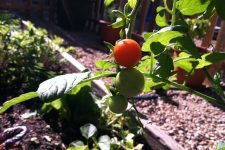 Looks like I have another vegetable I’m going to have to squeeze into my garden this summer. I would love to eat seasonally all winter long (and also to preserve enough during the summer to enjoy throughout the winter), but around here, NOTHING is in season, not even the things you mentioned. Which confuses me because it’s not like we’re in the tundra or anything, lol, we’re not even that far north (Maryland). There are no CSAs during the winter here (they only run May-Nov), no farmers’ markets, no local produce nothing. Interesting ingredients! I need to try something like this. Around here, soups with root vegetables and winter squash are staple items. it’s through my CSA program that i even figured out what seasonal here on the West coast. Before that, I had no idea! And you’re right – it just takes a little creativity when trying to figure out what to do with those turnips. again. 😉 Soups; Bakes; Mac & Cheese; New Breakfast Ideas; Roasted Veggie Everything – i love winter veg! In fact, I just made a winter sunchoke recipe that was very enjoyable! Enchiladas were already on the menu for this week but these look so much more nutritious than what I had in mind! Suddenly I can’t wait to go grocery shopping for some greens and root veggies! I’ll make extra of the veggie combo to include in “taquitos” for lunches later in the week. Can I encourage folks to take up your idea of getting to know the farmers. This will help when it comes to whether to eat pasture fed meat or not. In the more northerly regions it is not practical or pleasant for cattle to be kept outside in the winter months. They may indeed be kept on pasture for as long as possible, but in the end a nice comfy barn, with plenty of room, plenty of good food i.e. good hay cut locally and perhaps supplemented with own veggies will mean happy contented cows even in winter, instead of miserable beasts outside just so they can be called pasture fed cattle. Having said that, if you live in the south then totally disregard what I have just said, they should be out enjoying the sunshine!